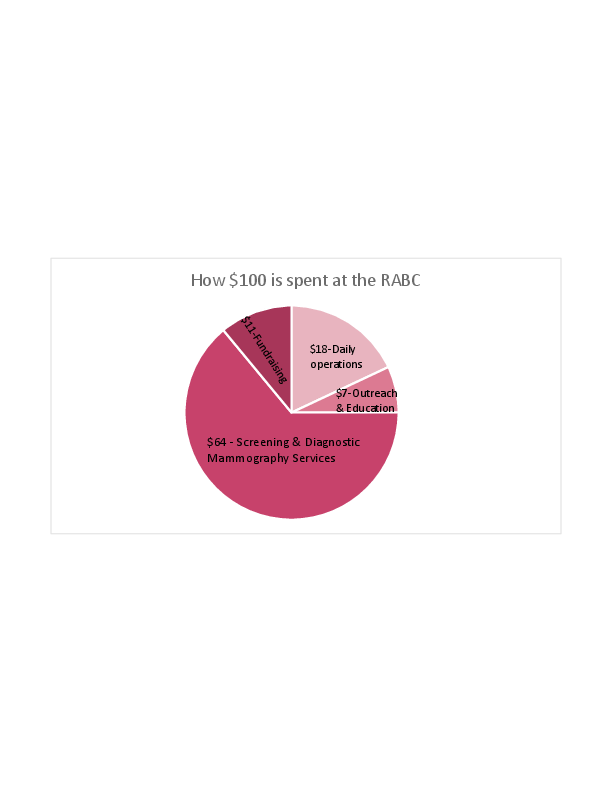 The RABC program funds screening/diagnostic mammograms for over 600 individuals in northeast Kansas each year and reaches hundreds more through community awareness and fundraising efforts. Breast cancer impacts not only women, but also their families, friends, workplace, and community. Breast cancer does not discriminate based on gender and that is why the RABC program also pays for mammograms for men who have a medical and financial need for one. Income for the corporation and our no-cost mammography program is primarily generated through charitable contributions from corporations, businesses and individuals. Fundraising events such as our Meals for Mammograms, Race Against Breast Cancer 5K Run/Walk and Bowling for Mammograms bowl-a-thon are held to raise funds for mammography services as well as to promote awareness of the program. All monies raised through these events remain in Northeast Kansas. The RABC is not supported by funds from the Susan G Komen Foundation, the United Way or government funding. Simply put, the RABC is self supported by those in Northeast Kansas who share our desire to see breast cancer caught in its earliest stages. The RABC thanks the community coalition (the American Cancer Society, the Junior League of Topeka, Inc., Stormont-Vail HealthCare and St. Francis Health Center) which gave us our beginning that lead to our formation as an independent non-profit organization. We are thankful to the vision and financial support of those organizations for creating the Race Against Breast Cancer and we look forward to serving our community for years to come. The Race Against Breast Cancer is a race we cannot lose!